Yesterday, the Israeli naval forces arrested 2 fishermen and wounded one of them as part of the Israeli attacks against Palestinian fishermen and preventing them from freely sailing and accessing the fish breeding areas. Yesterday afternoon, The Israeli forces declared that they reduced the area allowed for fishing in the Gaza Sea to 6 nautical miles, deteriorating the economic and living conditions of the fishermen and inflicting great losses due to restricting their movement and denying their access to the areas where fish breed. According to investigations conducted by the Palestinian Center for Human Rights (PCHR), at approximately 06:15, on Saturday, 06 October 2018, the Israeli gunboats stationed off the northwestern shore of al-Waha resort, northwest of Beit Lahia in the northern Gaza Strip, opened fire at the Palestinian fishing boats that were sailing within 2 nautical miles. The gunboats surrounded a fishing boat manned by Safwat Zayet Mahmoud Zayed (42) and his brother Ref’at (29). The Israeli naval soldiers ordered both fishermen to take their clothes off, jump to the sea and swim towards one of the gunboats. Both fishermen were then taken to Ashdod Seaport without confiscating their boat. 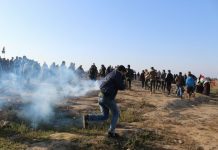 At approximately 17:20 on the same day, the Israeli authorities released both fishermen via Beit Hanoun “Erez” crossing, noting that Ref’at was found wounded with 2 rubber-coated bullets to the left leg and thigh. On 06 October 2018, the Israeli authorties decided to reduce the area allowed for fishing to 6 nautical miles along the Gaza Strip shores. This is part of the Israeli policy to impose restrictions on fishermen and target their livelihoods. Calls for releasing the arrested fishermen and compensate them for their losses.